SOUTH BEND, Ind. 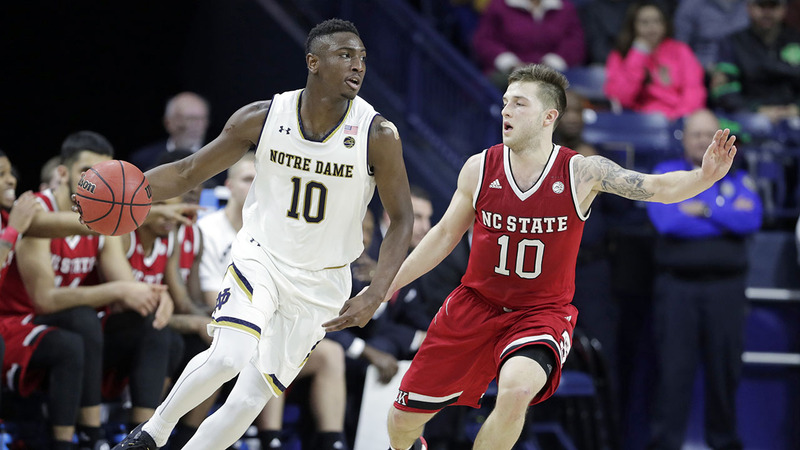 -- T.J. Gibbs scored a game-high 22 points to lead four players in double figures as Notre Dame gave coach Mike Brey his school-record 394th victory, an 88-58 Atlantic Coast Conference triumph Wednesday night over North Carolina State. The Irish (12-3, 2-0 ACC) played without senior All-American Bonzie Colson, who is scheduled for Thursday surgery on a broken left foot, and for more than 25 minutes without senior point guard Matt Farrell, who sat next to him after suffering his own left foot injury after a hard fall in the first half. D.J. Harvey, who started in Colson's place, had a career-high 17 points, Rex Pflueger had 16 and Martinas Geben 10 points as Brey passed former Irish coach Digger Phelps, who was courtside, to become Notre Dame's all-time leader in men's basketball victories. Harvey scored 13 points as Notre Dame took a 48-36 halftime lead thanks to 61.3 percent (19 of 31) shooting, including 9 of 18 from beyond the arc. Gibbs added 11 as Notre Dame overcame the loss of Farrell, who had nine points with three 3-pointers, four assists and two of the team's eight first-half steals before a hard fall with 5:09 left. N.C. State (10-5, 0-2) went 5:42 without a point at the end of the first half and the beginning of the second, and the Irish eventually used a 17-2 run to start the second half and pulled away to a 65-38 lead. Allerik Freeman led N.C. State with 13 points and Lennard Freeman had 10. N.C. State: The Pack returns home after an 0-2 road trip that started with a 78-62 loss at Clemson last Saturday. Coach Kevin Keatts' team was its own worst enemy with nine turnovers in the first half and being outscored 17-2 by the Irish to start the second half. Things will have to clean up in a hurry as No. 2 Duke comes in Saturday night and is followed by Clemson Jan. 11. Notre Dame: The Irish played their first game without senior All-American Bonzie Colson and his double-double averages of 21.4 points and 10.4 rebounds that will be missing for eight weeks. But Brey got inspired performances using a 9-man rotation. N.C. State: Hosts No. 2 Duke Saturday. Notre Dame: Visits Syracuse Saturday.